For one of my projects i had to make a multiplayer game. As such i decided to make a split screen battle ship game. This game has you able to fire both missiles and torpedo, different power ups and a dynamic heath system that has the boats change the way they look the less heath they have. 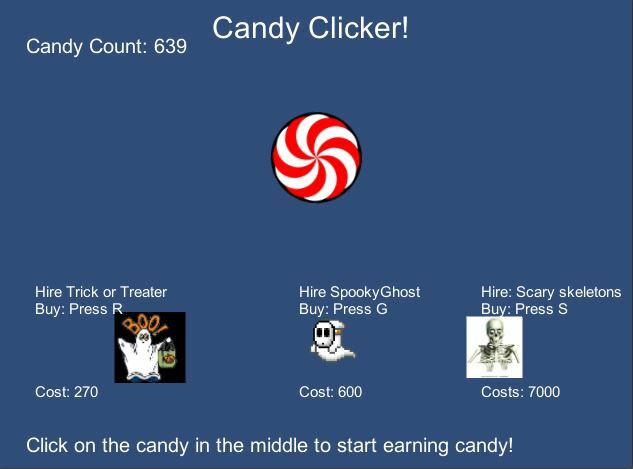 Candy Clicker is a homage Cookie Clicker. The game is a simple clone that has you click on the candy in the middle to earn candy that can then be cashed in to buy upgrades that auto generates candy for you to cash in to buy upgrades etc.